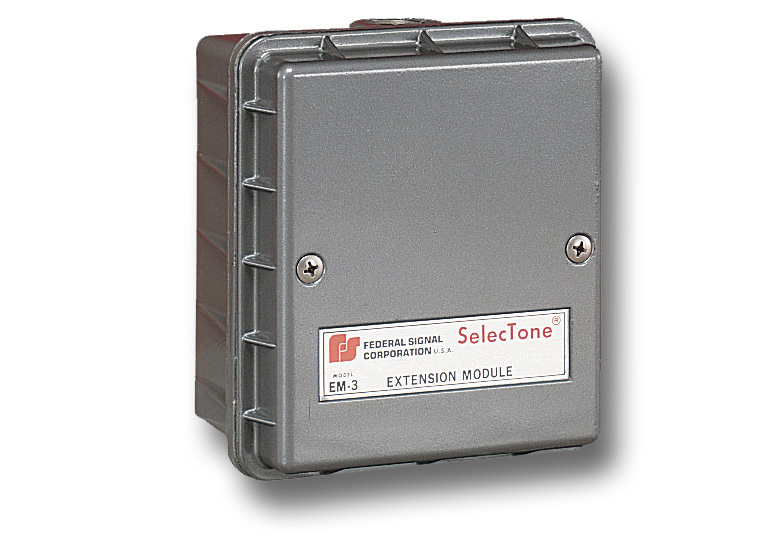 Model EM3 SelecTone® Extension Module is designed to add multi-tone capability to an individual SelecTone unit and can be used with Models 50GC, 300, 300GC, and 302GC. The die-cast aluminum alloy housing has the same dimensions as the main amplifier housing of the above mentioned models and is sealed with gray enamel paint. The EM3’s internal components are protected from the elements by dust- and moisture-proof seals. Its internal components are a wiring terminal strip, edge connector slots for three Model UTM tone modules and an interface to connect to a SelecTone 300, 300GC, or 302GC signaling device. The EM3 is not compatible with the TM33 Tone Module. With the EM3, three functions can be simultaneously monitored rather than one. Tone activation and selection is accomplished by user-supplied, normally-open dry contacts. Where voice communication is not necessary and the application requirements dictate up to three tone signals, the EM3 Extension Module allows a single SelecTone audible signal to fill those needs.